Review: “Spider-Man: Into the Spider-Verse” Blu-ray – Bagel! Sony: And it’s not Peter Parker? Sony: And there’s going to be lots of Spider-Men? Production Team: They won’t all be men. Or Human. Sony: ……….Have you all been dropping peyote again? It works. It completely, totally and utterly works. Against pretty much every shred of common sense, logic, and what have you, it works. Somehow Chris Miller and Phil Lord have created maybe the best Spider-Man movie ever. Apparently they are geniuses, given that this marks at least the second time that the pair made something incredible out of what would have been a dumpster fire under any other hands. Did anyone think a movie made out of LEGOs would ever be good either? So, Spider-Man: Into the Spider-Verse is centered on Miles Morales, a mixed-race/ethnicity kid from Brooklyn. Apparently a part of Brooklyn that hasn’t been run over by the redevelopment train as Miles’s family can still afford to live there with his public-servant parents. Dad is a cop and mom is a hospital nurse. As we meet Miles, he is being ushered off to a special weekday boarding school for high-achieving kids despite his vehement protests about not wanting to go. Miles also has an Uncle Aaron of indeterminate employment who is on bad terms with Miles’s dad, which of course makes him Miles’s go-to when he is stressed. Through a slight plot-contrivance Miles get the spider bite that turns him into Spider-Man. Well, a Spider-Man actually. We do meet Spider-Man as we know him, Peter Parker, at the very start of the movie, giving a very brief ride through his life, complete with references to the first 3 Spider-Man movies (though oddly no references to the second franchise starring Andrew Garfield). Spider bites apparently work quickly, as Miles goes from high-school kid to high-school-kid-with-badly-fitting-clothes-and-hands-he can’t-keep-from-sticking very quickly. Peter and Miles don’t get to bond for long, as it turns out that Spider-Man and the spider that bit Miles are all connected to the Kingpin and his particle accelerator experiments into alternate dimensions. While they do briefly stop Kingpin, Peter is killed. And then he’s back. Sort of. No, this isn’t the zombie Marvel universe, but “a” Peter is back. Peter B Parker. Older, slightly greying…err…”thicker”. Rather more jaded and cynical about the super-hero gig. Also not in his own universe, because when Miles and the first Spider-Man/Peter Parker stopped the accelerator, they accidentally ripped open space-time and pulled a whole load of Spider-People into Miles’s universe. To be specific, 5 of them, including Peter B. Parker, Spider Gwen, Spider-Man Noir who is quite literally black-and-white, Peni Parker and her robot SP//dr, and Spider-Ham who is literally a pig and/or walking copyright violation. Together, they fight crime! No, seriously, they totally fight crime via trying to stop Kingpin and get all the non-Miles Spider-Beings back where they belong. Of course, through most of this, Miles has no clue what he is doing. At all. Even by beginner Spider-Man standards, he’s very klutzy and has little ability to control when he does and does not stick to things. He does learn the ropes eventually, but Miles is also trying to balance the crazy new school schedule and figuring out his relationship with his dad, who really doesn’t like Spider-Man as an idea. Is Spider-Man: Into the Spider-Verse the best Spider-Man movie ever? Possibly. It is definitely the most unique. The animation team apparently almost fried Imageworks servers as they came up with crazier and crazier animations. 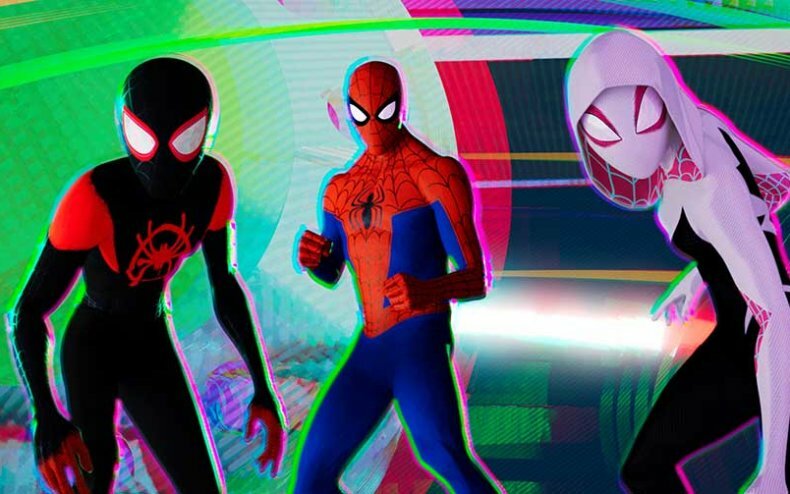 Spider-Man: Into the Spider-Verse looks like nothing you have seen before in a movie. Somehow the team managed to layer overtly comic book visuals, borderline photo-realistic images, stylized character designs and at least 10,000 other things into a single harmonious yet completely crazy visual style. You could probably watch this 10 times and find something new each time. And that’s not even including the cast performances. Every actor is perfectly cast, even if they don’t always get enough dialogue to be developed beyond their basic idea. Peni, Spider-Man Noir and Spider-Ham in particular don’t get to do nearly enough. This is a small complaint, though. Shameik Moore (Miles), Jake Johnson (Peter B. Parker), Hailee Steinfeld (Gwen), Mahershala Ali (Uncle Aaron), and Brian Tyree Henry (Miles’ dad) in particular do absolutely dynamite work. The Blu-ray comes with a pretty nice set of extras. The big two are the crew commentary track of the theatrical movie and a “alternate universe” version of the movie that mixes the theatrical cut with a bunch of story boards and some animatics that tell a very different version of the story. Some of the alternate ideas are actually really good, but were cut for probably good reasons like “We don’t want a 2.5 hour movie” and “This is way too similar to Spider-Man: Homecoming.” The commentary on the theatrical cut is a must-listen for anyone interested in the production process as they go surprisingly deep into how difficult it was to get this movie to come together. There are also some bits of puff-piece cast and crew interviews in a separate extras area, a tribute to Stan Lee and Steve Ditko, and a guide to some of the multitude of Easter Eggs buried throughout the movie. 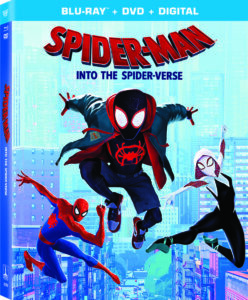 Also included is a new Spider-Ham short that functions as both a lead-in to the movie and a rib-cracklingly funny riff on animation as a whole. I can’t recommend this one enough. It’s the Spider-Man we never knew we wanted, but can’t live without.